At Vuly Trampolines, we don't consider Valentine’s Day a solely romantic occasion, and you don't have to leave the kids out! It can be a fun time to remind your little ones of how much you love them, or to show your family how important they are as a whole. Whether you have family members who are fans of scrumptious savoury snacks or those who enjoy the sweeter things in life, one of our delicious and healthy Valentine’s Day recipes is sure to hit the spot: Cupid style! A fresh and tangy appetiser or snack, these garlic prawns are a gorgeous Valentine’s Day-themed bite when arranged in cute heart shapes. Combine olive oil, garlic and paprika in a large saucepan. Cook for few minutes over a medium heat, and then increase the heat to high. Add prawns, stirring for 4 minutes, until they have turned red in colour. Remove them from the heat. Stir through your parsley, add a pinch of salt and a squeeze lime juice to taste. 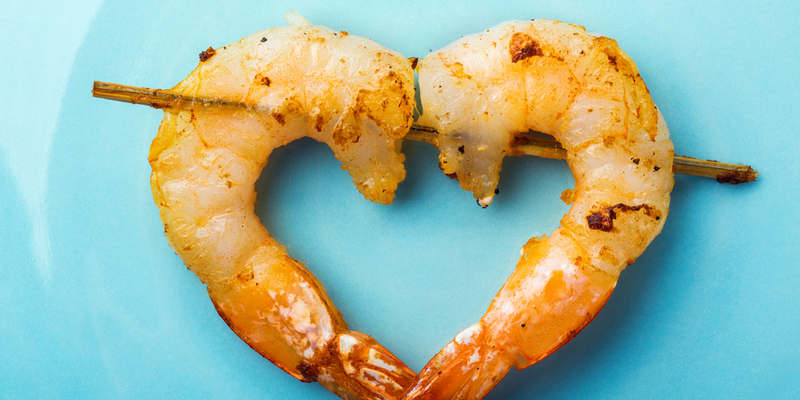 Arrange the prawns into ‘heart’ shapes on a platter, and skewer them together, to serve. A Valentine’s Day staple—chocolate and strawberries are both romantic and crowd-pleasing, if you're including the kids. Opt for dark chocolate for a healthier option. Break your block of chocolate into multiple pieces and place them in a heatproof bowl. Fill a saucepan halfway with water, and bring it to the boil. Place your heatproof bowl over the saucepan, ensuring that the bottom of the bowl does not touch the water. Stir your chocolate until it melts, and then carefully remove it from the heat. Dip your strawberries into the chocolate, and then cover them with your sprinkles. Place the strawberries onto a tray and into the fridge to set. Here's one that you can whip up in a matter of minutes. Our chocolate mousse tastes rich and indulgent, but it sits quite a few rungs down on the naughty ladder! Scoop the avocado into a food processor, and add in the maple syrup, cacao powder, coconut oil, vanilla extract and sea salt. Blend until smooth, and then spoon the mixture into serving pots. Every kid loves homemade chips! These cute little rosemary potato hearts are super simple to make and will leave the whole family wanting more. Bring a saucepan of water to the boil, and then add the potatoes. Cook for 10 minutes or until softened. Drain and cool the potatoes, and then slice them into thick discs. Cut small heart shapes out of the potato discs, using the cookie cutter. Place your potato hearts onto an oven tray, and drizzle them with olive oil. Sprinkle with sea salt and dried rosemary, and then place them into the oven for 25-30 minutes—until crispy and golden. Which Valentine’s Day-themed recipes have your kids helped to create this year? We’d love to hear how you’ve spread a little love through the whole family this Valentine’s Day!